Regardless of what Phil said yesterday, this week, I saw the first sign of spring in Chicago. 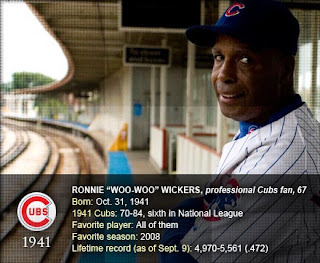 Sixty-nine years young, Ronnie is the pure definition of a “super fan.” Ronnie began following the Cubs in the 1940’s, but it wasn’t until around 1958 or 1959 when he began “whooing” as a way of cheering for the Cubs. Ronnie’s story is actually very remarkable. He had a trouble childhood, was homeless and didn’t have a stable job for a portion of his life. But working nights as a custodian got Ronnie on the right track. To keep his spirit alive, he attended Cubs games from 1984 to 1990 with donated tickets – whooing fans and wearing a full on Cubs uniform. He has become an unofficial mascot of the team. Because of his superfan status, Ronnie now brings in an income from paid appearances at parties and has even stared in local commercials. He’s a star to Cubs fans and has even sang “Take Me Out to the Ball Game” during the seventh inning stretch. So as I was taking the train back from the grocery store on Sunday, Ronnie was riding the elevator directly behind me. He actually stopped to let me go ahead (ladies first). While it was clearly the last day of January, Ronnie was decked out in his Cubs uniform. Alas, spring is on its way in Chicago.